We make use of the existence of cell-disjoint paths in the 3D grid topology to design a new highly reliable adaptive geographic routing protocol called Grid-based Adaptive Routing Protocol (GARP) for Underwater Wireless Sensor Networks. In GARP, the underwater environment is viewed as a virtual 3D grid of cells. A packet is forwarded following a pre-constructed routing path from a node in a grid cell to a node in a neighbouring grid cell repeatedly until the destination sink node is reached. When a selected routing path becomes unavailable, GARP adapts to the condition by switching to an alternative path making use of the existing cell-disjoint paths. Since the protocol uses pre-constructed routing paths, it avoids path establishment and path maintenance overheads. Analytical performance evaluation results for GARP are obtained showing its high reliability. In tested cases, the delivery ratio has approached 100% when the network density has reached a minimum number of sensor nodes per grid cell. Underwater Wireless Sensor Networks, Routing Protocol, Adaptive Routing, Disjoint Paths, 3D Grid. Underwater Wireless Sensor Networks (UWSNs) are used for communication underwater for military and non-military applications  such as undersea exploration of natural resources, tactical supervision and mines detection. They may contain hundreds or even thousands of sensor nodes. Many related research problems have attracted attention including deployment strategies , reliable communication, routing , medium access , localization  and energy conservation . Radio waves cannot be used under water due to rapid attenuation. Acoustic waves are considered the only feasible medium that works satisfactorily in underwater environments. Compared to radio waves, acoustic waves have higher propagation delay and lower bandwidth under water. Another feature of UWSNs is their dynamic topology due to passive movement of sensors with water currents. Routing is a fundamental problem that needs to be solved for large coverage areas in energy-limited UWSNs. Sending packets over multiple short hops has been proven more energy efficient for UWSNs than sending over a single long hop . However routing over more hops ultimately degrades the end-to-end reliability especially for the harsh underwater environment. Several routing protocols for UWSNs have been proposed. Surveys of routing techniques, protocols and routing issues can be found in ,  and  respectively. We present in the following brief descriptions of some of these protocols. In  the authors propose a protocol called Vector-Based Forwarding Protocol (VBF). In VBF, each packet carries the positions of the sender, the target and the forwarder (i.e., the node which forwards this packet). The forwarding path is specified by the routing vector from the sender to the target. Upon receiving a packet, a node computes its relative position to the forwarder by measuring its distance to the forwarder. Recursively, all the nodes receiving the packet compute their positions. If a node determines that it is close to the routing vector enough (e.g., less than a predefined distance threshold), it puts its own computed position in the packet and continues forwarding the packet; otherwise, it simply discards the packet. Therefore, the forwarding path is virtually a routing “pipe” from the source to the target: the sensor nodes inside this pipe are eligible for packet forwarding, and those outside the pipe do not forward. In  the authors propose an improvement to VBF called Hop-by-Hop Vector-Based Forwarding (HH-VBF). Unlike the original VBF approach, HH-VBF uses a routing vector for each individual forwarder in the network, instead of a single network-wide source-to-sink routing vector. The hop-by-hop vectors of HH-VBF allow overcoming two problems of the VBF related to low delivery ratio for sparse networks and sensitivity to the routing pipe radius threshold. In  the authors propose a depth based protocol called DBR. It does not need full-dimensional location information of the sensors. It only requires knowledge of the local depth at each node which can be obtained from a depth sensor. The authors argue that the information receivers are usually located on the surface of the water, and therefore propose to forward the packets greedily (based on the depth of each sensor node) to the receivers at the surface of the water. When a node receives a packet, it forwards it if its depth is smaller than the one embedded in the packet otherwise it discards the packet. 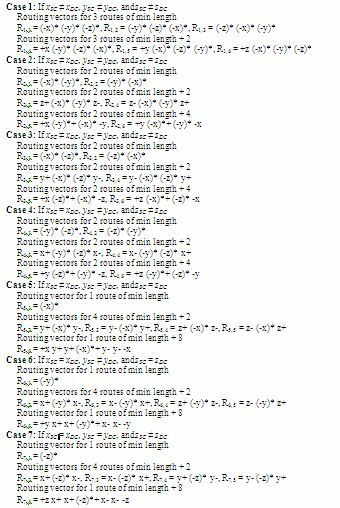 In  the Focused Beam Routing Protocol is introduced. When a node A wants to send a packet to a node B, node A issues a multicast request to send (RTS) to its neighbours. All the nodes that receive A’s multicast RTS first calculate their location relative to the AB line. Nodes which lie within a cone of a specified angle emanating from the transmitter towards the final destination are candidates for forwarding. In  a routing protocol for UWSNs, called multi-path routing protocol (MPR), is proposed to improve the transmission delay. It uses a multi-path during the path construction from the source node to the destination node. A multi-path is composed of a series of sub-paths. Each sub-path is from a sending node to a two-hop neighbouring node. In  the authors propose an adaptive hop-by-hop vector-based forwarding routing protocol on the basis of HH-VBF called AHH-VBF. During the transmission process, the radius of a virtual pipeline is adaptively changed hop by hop to restrict the forwarding range. The transmission power level is also adaptively adjusted hop by hop in a cross-layer fashion to improve the energy-efficiency. The forwarding nodes are selected based on the distance from the current node to the destination node to reduce the end-to-end delays. In  the authors propose a routing protocol that exploits the measured pressure levels to route data to the sink nodes at the surface. It uses an opportunistic routing mechanism to select the subset of forwarders that maximizes the greedy progress. It limits co-channel interference and uses a dead end recovery method. In  a time-based priority forwarding mechanism is proposed to tackle the problem of asymmetric links. A link detection mechanism is employed to get link state information (symmetrical link or asymmetric link), and an adaptive routing feedback method is adopted to make use of the underwater asymmetric links and save energy. In  the authors investigate a mobile geo-cast problem in three-dimensional underwater sensor networks aiming to overcome the hole problem and to minimize the energy consumption. An autonomous underwater vehicle (AUV) travels a user-defined route and continuously collects data from sensor nodes within a series of 3D zones at different times. In a first phase the routing protocol collects data within a 3D zone and in a second phase it wakes up the sensor nodes in the next 3D zone to be queried while trying to avoid topology holes. An “apple slice” technique is used to build multiple segments to surround a hole and to assure routing path continuity. In  the authors propose a Void-Aware Pressure Routing (VAPR) protocol that uses a sequence number, hop count and depth information embedded in periodic beacons to set up next-hop direction and to build a directional trail to the closest sink node. Using this trail, opportunistic directional forwarding can be performed even in the presence of voids. In  the authors propose a new multi-hop routing protocol for underwater wireless sensor networks called Channel-aware Routing Protocol (CARP). It exploits link quality information for data forwarding. Nodes are selected as relays if they exhibit the recent history of successful transmissions to their neighbours. CARP avoids loops and can route around connectivity voids and shadow zones by using topology information. The protocol uses power control for selecting robust links. In  the authors propose a Hop-by-Hop Dynamic Addressing Based (H2-DAB) routing protocol in order to handle the problem of node mobility in UWSNs. Every node in the network is assigned a routable address without requiring explicit configuration or dimensional location information. Nodes communicate without centralized infrastructure. In  the authors propose a harmonic potential field based routing protocol for 3D underwater sensor networks to tackle the issue of local minima. The harmonic potential field is calculated using harmonic functions. In this paper, we propose a new routing protocol for UWSNs called the Grid-based Adaptive Routing Protocol (GARP) which offers high reliability. GARP views the underwater geographical region of the UWSN as a three-dimensional (3D) grid of cells as shown in figure 1. GARP makes use of the existence of multiple cell-disjoint paths in this 3D grid. A packet is forwarded following a pre-constructed routing path from a node in a grid cell to a node in a neighbouring grid cell repeatedly until the destination sink node is reached as illustrated in figure 1. When a selected routing path becomes unavailable (due for example to node mobility or a node running out of battery), GARP adapts to the condition by switching to an alternative path from the set of available cell-disjoint paths between the current cell and the destination cell. The mechanisms used for identifying the routing paths and forwarding the packets incur low communication overheads and hence low energy consumption. Each node maintains a list of cell head nodes located in neighbouring grid cells to assist in packet forwarding. The maintenance of the cell head nodes is based on hello beacons and on normal traffic with no cell head election costs. The packet forwarding load in a cell is automatically distributed over the nodes in the cell with no load balancing overhead. Packet delivery ratio results are derived showing the high reliability of the proposed protocol. The remainder of the paper is organized as follows: section 2 presents some assumptions and notations; section 3 describes the proposed GARP routing protocol; section 4 presents a derivation of a packet delivery probability expression for GARP with some analysis, and section 5 concludes the paper. We assume an underwater wireless sensor network (UWSN) is composed of N sensor nodes deployed in a given underwater region. The underwater sensor nodes need to send collected data to sink nodes located at the water surface. We view the underwater region where the sensor nodes are deployed as a virtual k´m´n three-dimensional (3D) grid of cells as shown in figure 1. The length of a side of a grid cell is denoted d. For the purpose of the proposed GARP routing protocol, two grid cells are considered neighbours if they have a common grid face. Therefore each grid cell has 6 neighbouring cells in the 6 directions: up, down, left, right, front, and back. A routing path is a sequence of neighbouring grid cells. Two UWSN nodes are called neighbouring nodes if they are located in neighbouring cells. The value of d is selected depending on the transmission range such that a node can communicate directly with all its neighbouring nodes (located in neighbouring grid cells). This requirement is met if d satisfies: . This can be seen by noticing that among the choices of farthest apart points in two adjacent grid cells are two diametrically opposite corners at distances 2d, d and d in the three dimensions. These two farthest apart points are at a Euclidian distance: . We set d to the limit in order to minimize the number of routing hops. Each grid cell is identified by a triple of cell coordinates (x, y, z) as illustrated in figure 1. We assume each UWSN node has a distinctive node id. We use letters such as S (source node id), D (destination node id) and H (cell head node id) to refer to node ids. We assume nodes are able to obtain their own as well as other nodes positions via a location service. We also assume that the current position of a node can be converted to the (x, y, z) cell coordinates of the grid cell where the node is located. In the proposed GARP protocol, each node selects at each of its six neighbouring cells one node located in that cell as the cell head. For this purpose, it is assumed that each sensor sends periodically a hello beacon containing its node id and the coordinates (x, y, z) of the grid cell where it is located. The latest node heard from at a neighbouring cell will be recorded as the cell head for that neighbouring grid cell. The cell head at a neighbouring cell is responsible for forwarding the packets that need to be routed through that cell. No other nodes are responsible of routing. GARP routes a packet in the 3D-grid by sending the packet from a node at a grid cell to a cell head at a neighbouring cell repeatedly until the sink node at the surface of the water is reached as illustrated in figure 1. Each node maintains a list of the ids of the cell head nodes for its six neighbouring grid cells. The six nodes selected by a node A as the cell heads at the neighbouring cells are denoted A+x, A-x,A+y, A-y, A+z,and A-z. When a node A does not hear any hello beacons from any node located in a given neighbouring cell, then node A sets the corresponding cell head to Null. The notations: –y, +y, y-, y+, (-y)*, (-y)*+, –z, +z, z-, z+, (-z)*, and (-z)*+ are defined similarly for the other two dimensions Y and Z. Depending on the relative positions of the source cell SC and the destination cell DC, 6 cell-disjoint paths from SC to DC each of minimum or near minimum length are constructed as described by the routing vectors in figure 2.The 7 cases of figure 2 cover all the cases of relative positions of the source cell SC and the destination cell DC. The cell-disjoint property of these routes is based on the results of  (see Theorem 2, Theorem 3 and Theorem 4 of ). When sending a packet from a source node to a destination node, one of the cell-disjoint paths between the source cell SC and the destination cell DC is followed using one of the routing vectors of figure 2. The routing vectors are stored at each node. At each hop, the next move indicated by the routing vector is followed until the packet reaches the destination cell. At any given time, packets originating at a source node S are routed towards a destination node D along one of the 6 cell-disjoint paths that exist between S and D corresponding to the 6 routing vectors listed in figure 2. To send a packet from a grid cell to the next grid cell along a routing path specified by one of the routing vectors of figure 2, a node (including the source node) sends the packet to the cell head of the neighbouring cell in the direction (x+, x-, y+, y-, z+ or z–) indicated by the next move on the routing vector. During the routing process, a packet carries a routing path identifier (i, S, D), 1≤ i ≤6, identifying one of the routing vectors between S and D. Each node S maintains for each destination node D in a routing table PATHS the value of i, 1 ≤ i ≤ 6, indicating which of the 6 cell-disjoint paths from S to D is currently being used as a routing path from S to D. If such a routing path becomes unavailable (due for example to node mobility or nodes running out of battery), then node S adjusts its routing table to switch to a different cell-disjoint path. The operation of the proposed GARP protocol is outlined in figure 3. When a source node S wants to send a packet P to a destination node D, it invokes the function GARP_Send(P, S, D). This function initiates the routing by attaching the path identifier (PATHS[D], S, D) to the packet and sending it to the neighbouring cell head (S+x, S-x,S+y, S-y, S+z,or S-z) depending on the direction of the first move of the routing vector associated with path number PATHS[D]. 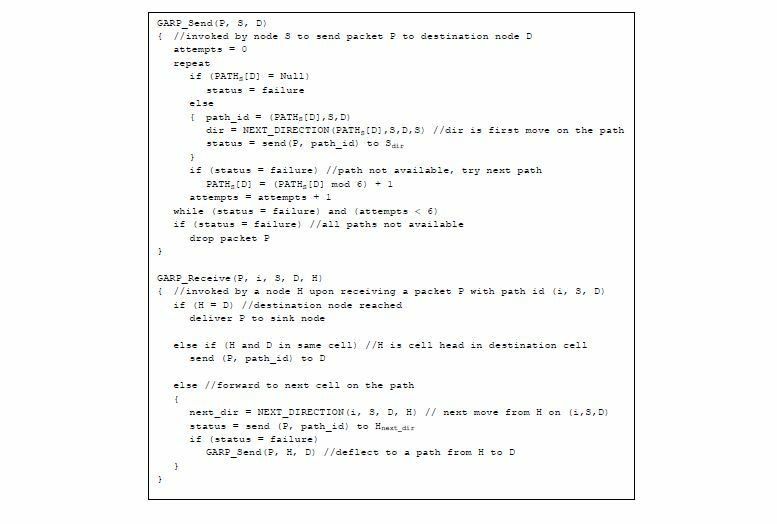 If this path is not available, the next path is attempted repeatedly until sending the packet on one of the 6 paths from S to D succeeds. If all 6 paths are not available then the packet is dropped. When a node H receives a packet P containing the path identifier (i, S, D), it calls the function GARP_Receive(P, i, S, D, H) which forwards the packet to the cell head at the neighbouring cell corresponding to the next move on the specified path (i, S, D). This step is repeated until the packet is received by the cell head of the destination cell which delivers it to the destination node D. At each hop the function call Next_Direction(i, S, D, H) determines the direction (x+, x-, y+, y-, z+ or z–) of the next cell based on the corresponding routing vector. If the forwarding of a packet by a node H fails, then node H deflects the packet by sending it along one of the 6 paths from H to D instead of continuing on the ith path (i, S, D) from S to D.
Each node maintains its list of neighbouring cell head nodes (one in each of the six directions: x+, x-, y+, y-, z+ or z–) independently from other nodes. A node continuously updates its list as it hears hello beacons and as it communicates with nodes in neighbouring cells. Every time a node hears a hello beacon or receives a packet from a node in a neighbouring cell in a certain direction (x+, x-, y+, y-, z+ or z–), it sets that node as the new cell head node in that direction. This avoids cell head election overheads and allows cost-free balancing of packet forwarding load among the nodes instead of concentrating this load at fixed selected cell heads. We assess the reliability of the proposed GARP protocol by driving a packet delivery ratio (probability) expression and analysing it. We start by obtaining an upper bound on the average increase over the minimum distance when routing using GARP. Result 1: For large enough UWSN region, the average increase over the minimum distance in the length of the routing paths of GARP is at most 2. = [1×(k-1)(m-1)(n-1) + 2×(k-1)(m-1) + 2×(k-1)(n-1) + 2×(m-1)(n-1) + (8/3)×(k-1) + (8/3)×(m-1) + (8/3)×(n-1)]/(kmn-1). For large enough k, m and n (i.e. for a large enough UWSN region) this expression does not exceed the value 2. Q.E.D. We now derive a lower bound for the probability of packet delivery. 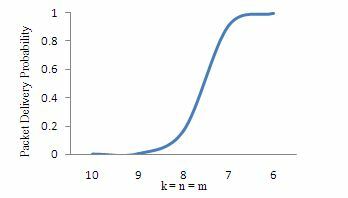 Pdelivery ≥ 1- [(1-(1 – 1/(k´m´n))N)k+m+n-1]6. Pdelivery ≥ 1- [1- Pdelivery on p]6 = 1- [(1-(1 – 1/(k´m´n))N)k+m+n-1]6. Q.E.D. Figure 4 plots Pdelivery versus the network density d = N/kmn. The network density is the average number of sensor nodes per grid cell. We observe a fast increase in the packet delivery probability as the network density d = N/kmn increases. The packet delivery probability approaches 1 when the network density reaches a minimum (an average of 3 nodes per grid cell in this experiment).With small density (sparse network), it is possible that some of the grid cells do not host any sensor nodes and therefore the paths that go through these (empty) cells cannot be used for routing packets resulting in a lower packet delivery probability. 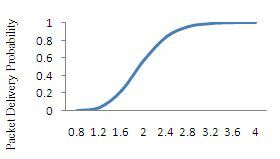 As the number of nodes increases, the probability that all the cells crossed by any path are non-empty increases and hence the packet delivery probability also increases and approaches 1 when a minimum in the average number of nodes per cell is reached. A similar fast increase of the packet delivery probability is observed in figure 5 where the number of sensor nodes is kept fixed but the grid dimensions (k, m, and n) are gradually decreased. We assumed in this experiment that k = m = n for simplicity. We conclude from this experiment that using smaller grid dimensions (k, m, and n) for a given underwater geographical area with a given number of sensor nodes is better (for higher packet delivery probability) than using larger grid dimensions. In other words, it is preferable to view the geographical area as a smaller number of big cells than as a larger number of small cells but of course, the cell size is limited by the transmission range since nodes in neighbouring grid cells must be able to communicate directly in GARP. With a smaller number of big cells, the routing paths are shorter (in terms of the number of hops) and hence the probability of successfully relaying a packet at each hop of its routing path is higher. We have proposed a new highly reliable adaptive routing protocol for Underwater Wireless Sensor Networks. It views the underwater area as a virtual 3-dimensional grid. It uses source routing over pre-constructed cell-disjoint paths avoiding costly path establishment and maintenance overheads. Packet delivery probability results have been derived for the proposed protocol. The obtained results show the high reliability of the proposed protocol. In tested cases, the delivery ratio has approached 100% when the network density reached a minimum number of sensor nodes per grid cell. We also conclude from our analysis that it is preferable(for higher packet delivery ratio) to view the geographical region where the sensor nodes are deployed as in the small number of large grid cells than as a large number of small grid cells as much as it is allowed by the transmission range. E. Felemban, F. K. Shaikh, U. M. Qureshi, A. A. Sheikh, and S. B. Qaisar (2015), Underwater Sensor Network Applications: A Comprehensive Survey, International Journal of Distributed Sensor Networks, vol. 2015, Article ID 896832. G. Han, C. Zhang, L. Shu, N. Sun, and Q. Li (2013), A Survey on Deployment Algorithms in Underwater Acoustic Sensor Networks, International Journal of Distributed Sensor Networks, vol. 2013, pp. 1–11. F. Al Salti, N. Alzeidi, and B. Arafeh (2016), EMGGR: An Energy-Efficient Multipath Grid-Based Geographic Routing Protocol for Underwater Wireless Sensor Networks, Wireless Networks,vol. 23, no. 4, pp. 1301–1314. 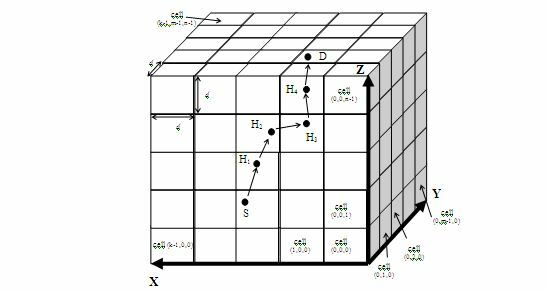 K. Chen, M. Ma, E. Cheng, F. Yuan, and W. Su (2014), A Survey on MAC Protocols for Underwater Wireless Sensor Networks, IEEE Communications Surveys & Tutorials, vol. 16, no. 3, pp. 1433–1447. G. Han, C. Zhang, L. Shu, and J. J. P. C. Rodrigues (2015), Impacts of Deployment Strategies on Localization Performance in Underwater Acoustic Sensor Networks, IEEE Transactions on Industrial Electronics, vol. 62, no. 3, pp. 1725–1733. M. Boulaiche and L. Bouallouche-Medjkoune (2014), EGGR: Energy-aware and Delivery Guarantee Geographic Routing protocol, Wireless Networks, vol. 21, no. 6, pp. 1765–1774. Z. H. Jiang (2008), Underwater Acoustic Networks-Issues and Solutions, International Journal of Intelligent Control and Systems, vol. 13, no. 3, pp.152-161. 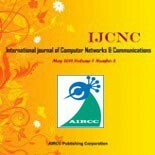 M. Ayaz, I. Baig, A. Abdullah, I. Faye (2011), A Survey on Routing Techniques in Underwater Wireless Sensor Networks, Journal of Network and Computer Applications, 34, 1908–1927. S. Sarafiabadi, A.Berqia, and S. Parvaneh (2012), Survey of Routing Protocols in Underwater WSNs for Mine Detection, 4th International Conference on Computer Modeling and Simulation (ICCMS 2012), IPCSIT vol. 22, IACSIT Press, Singapore, pp. 234-237. M. Khalid, Z. Ullah, N. Ahmad, M. Arshad, B. Jan, Y. Cao, and A. Adnan (2017), A Survey of Routing Issues and Associated Protocols in Underwater Wireless Sensor Networks, Journal of Sensors, vol. 2017, Article ID 7539751. P.Xie, J. H. Cui, and L. Lao (2006), VBF: Vector-Based Forwarding Protocol for Underwater Sensor Networks, Proc. of IFIP Networking’06, Coimbra, Portugal. N. Nicolaou, A. See, P.Xie, and J. H. Cui (2007), Dario Maggiorini, Improving the Robustness of Location-Based Routing for Underwater Sensor Networks, IEEE Oceans, vol. 5, 6, pp. 1-6. H. Yan, Z. J. Shi, and J. H. Cui (2008), Depth Based Routing for Underwater Sensor Networks, Proceedings of the 7th International IFIP-TC6 Networking Conference on Ad-Hoc and Sensor Networks, Wireless Networks, Next Generation Internet. J. M. Jornet, M. Stojanovic, and M. Zorzi (2008), Focused Beam Routing Protocol for Underwater Acoustic Networks, International Conference on Mobile Computing and Networking, ACM International Workshop on Underwater Networks, pp. 75-82. Y. S. Chen, T. Y.Juang, Y. W. Lin, and I. C. Tsai (2010), A Low Propagation Delay Multi-Path Routing Protocol for Underwater Sensor Networks, J. of Internet Technology, vol. 11, no. 2. H. Yu, N. Yao, and J. Liu (2015), An adaptive Routing Protocol in Underwater Sparse Acoustic Sensor Networks, Ad Hoc Networks, vol. 34, pp. 121–143. Y. Noh, U. Lee, S. Lee et al. (2016), HydroCast: Pressure Routing for Underwater Sensor Networks, IEEE Transactions on Vehicular Technology, vol. 65, no. 1, pp. 333–347. S. Zhang, D. Li, and J. Chen (2013), A Link-State Based Adaptive Feedback Routing for Underwater Acoustic Sensor Networks, IEEE Sensors Journal, vol. 13, no. 11, pp. 4402–4412. Y. S. Chen and Y. W. Lin (2013), Mobicast Routing Protocol for Underwater Sensor Networks, IEEE Sensors Journal, vol. 13, no. 2, pp. 737–749. Y. Noh, U. Lee, P. Wang, B. S. C. Choi, and M. Gerla (2013), VAPR Void-Aware Pressure Routing for Underwater Sensor Networks, IEEE Transactions on Mobile Computing, vol. 12, no. 5, pp. 895–908. S. Basagni, C. Petrioli, R. Petroccia, and D. Spaccini (2015), CARP: A Channel-Aware Routing Protocol for Underwater Acoustic Wireless Networks, Ad Hoc Networks, vol. 34, pp. 92–104. M. Ayaz, A. Abdullah, I. Faye, and Y. Batira (2012), An Efficient Dynamic Addressing Based Routing Protocol for Underwater Wireless Sensor Networks, Computer Communications, vol. 35, no. 4, pp. 475–486. M. Gao, Z. Chen, X. Yao, and N. Xu (2016), Harmonic Potential Field Based Routing Protocol for 3D Underwater Sensor Networks, in Proceedings of the 11th ACM International Conference on Underwater Networks and Systems, p. 38. K. Day and A.E. Al-Ayyoub (1997), The Fault Diameter of k-ary n-cube Networks, IEEE Trans. on Parallel and Distributed Systems, vol. 8, no. 9, pp. 903-907. Khaled Day received his PhD degree in computer science from the University of Minnesota (USA) in 1992. He has joined Sultan Qaboos University in 1996 where he is currently holding a Professor position.His research interests include interconnection networks, parallel computing, distributed systems and wireless and mobile networks. He is a senior member of IEEE. M.Sc. degree in Computer Science from Orsay Paris-Sud University in 1988 and Ph.D. degree in Computer Science from Institute Polytechnique deGrenoble (France) in 1992. He is an Associate Professor in the Department of Computer Science at Sultan Qaboos University in Oman. His research interests include Cloud Computing, Parallel and Distributed Computing, Wireless and Mobile Networks, Network On Ship (NoC), Cryptography and Network Security, Interconnection Networks, Performance Evaluation, Numerical Methods.Dr. Touzene is a member of the IEEE, and the IEEE Computer Society. Bassel R. Arafeh received the B.Sc. in Electrical Engineering from Cairo University, Egypt, in 1974; and the M.E. degree in Electrical Engineering and the Ph.D. degree in Computer Science from Texas A & M University, College Station, Texas in 1980 and 1986, respectively. Dr. Arafeh is currently an Associate Professor in the Department of Computer Engineering and Computer Science, University of Louisville, Louisville, Kentucky, USA. His research interests include wireless ad hoc and sensor networks, and parallel and distributed computing systems. He is a member of the ACM, the IEEE and IEEE Computer Society. asser Alzeidi received his PhD degree in Computer Science from the University of Glasgow (UK) in 2007. He is currently an Assistant Professor of computer science and the Director of the Center for Information Systems at Sultan Qaboos University, Oman. His research interests include performance evaluation of communication systems, wireless networks, interconnection networks, System on Chip architectures and parallel and distributed computing. He is a member of the IEEE.